"In 2009, there were 105,827 live births in the United States to women ages 40 through 44 -- 7,320 live births to women 45 to 49 -- 569 live births to women 50-54. In 2009, there were only 783 live births to women over 43, using donor eggs." Women in their 40s -- The birth rate for women aged 40–44 was 11.0 births per 1,000 women in 2015, up 4% from 2014. The 2015 rate for this group is the highest since 1966. Women aged 45-49 -- The birth rate for women aged 45–49 (which includes births to women aged 50 and over) was 0.8 births per 1,000 women in 2015, unchanged from 2014 and 2013. The number of births to women aged 45 and over rose 6% from 2014 to 2015. Women aged 50 and over -- There were 754 births to women aged 50 and over in 2015 compared with 743 in 2014. The number of births to women in this age group has generally increased since 1997 when data for women aged 50 and over became available again. The birth rate for women aged 50–54 was 0.7 births per 10,000 women in 2015, up from 2014. 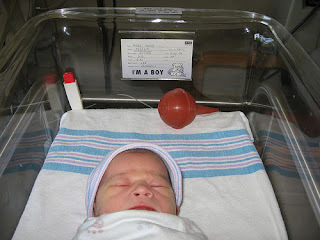 NOTE: In this report, tables labeled 45-49 years, 45-54 years, and 50-54 years include births to mothers up to age 64. How old were the women who used ART in the United States in 2008?Figure 3: The largest group of women using ART services were women younger than age 35. These women represented approximately 38% of all ART cycles performed in 2014. About 20% of ART cycles were performed among women aged 35–37, 19% among women aged 38–40, 10% among women aged 41–42, 7% among women aged 43–44, and 6% among women older than age 44. The average age of women using ART services in 2014 was 36. How did the types of ART cycles used in the United States differ among women of different ages? Figure 4 shows that, in 2014, the percentage of ART cycles in which a woman used her own eggs declined with age, while the percentage of ART cycles using a donor egg increased with age. The vast majority (96%) of women younger than age 35 used their own eggs (nondonor), and about 4% used donor eggs. 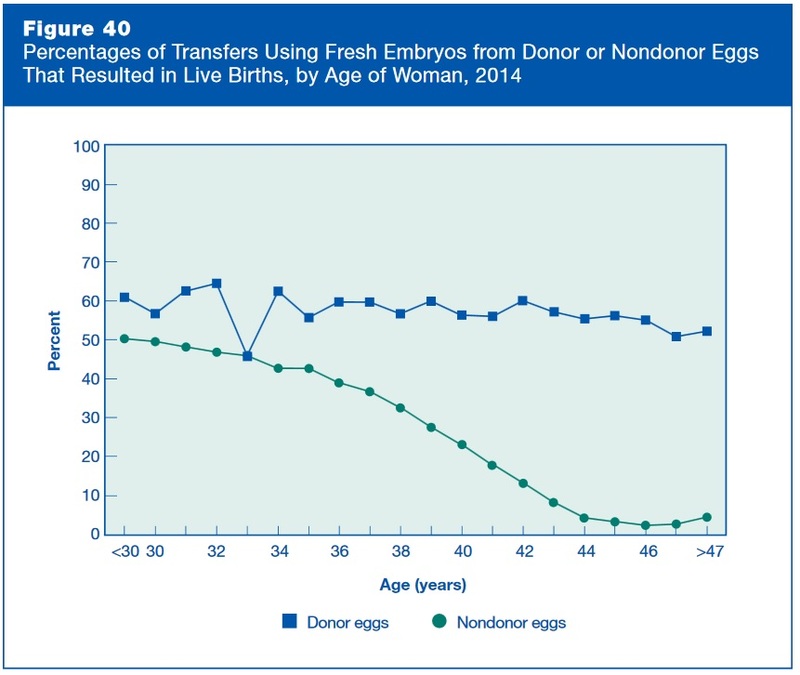 In contrast, 35% of women aged 43–44 and 68% of women older than age 44 used donor eggs. Was the use of donor eggs or embryos higher among older women undergoing ART? 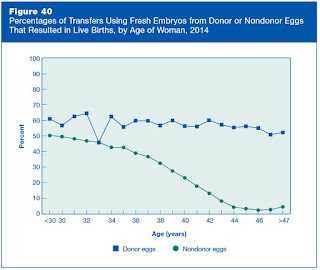 The percentage of cycles performed with donor eggs increased sharply after age 40. Among women older than age 48, for example, approximately 86% of all ART cycles used donor eggs. Eggs produced by women in older age groups form embryos that are less likely to implant and more likely to result in miscarriage if they do implant. "In 2015, there were 224,938 live births in the United States to women ages 40 through 54 -- 754 of those live births to women 50-54. In 2014, there were only 783 live births to women over 43, using donor eggs."